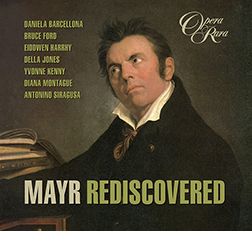 Between 1794 and 1824, Mayr composed over sixty operas. 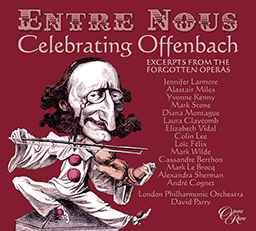 Admired for his combination of Italianate melody and Germanic harmony and instrumentation, he is a composer whose music explores the psychology of his characters with deeply satisfying thoughtfulness, as this absorbing selection of excerpts from his operas demonstrates. Between 1794 and 1824, Mayr composed over sixty operas. 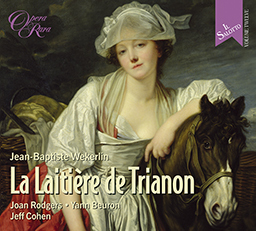 Admired for his combination of Italianate melody and Germanic harmony and instrumentation, he is a composer whose music explores the psychology of his characters with deeply satisfying thoughtfulness, as this absorbing selection of excerpts from his operas demonstrates. Giovanni Simone Mayr was born in Mendorf, a small village near Ingolstadt in Bavaria, on 14 June 1763. Ever ambitious to study in Italy, he travelled to Bergamo and on to Venice. He is particularly remembered for Medea in Corinto (Naples, 1813), but many of his works enjoyed great success and were widely heard in their day.In 1803, Mayr was appointed maestro di cappella of S. Maria Maggiore, the great Romanesque basilica of Bergamo, a position which gave him a home-base and a stability enjoyed by few composers of the time. It was in Bergamo that he also became famous as a teacher, founding in 1806 his celebrated lezioni caritatevoli or ‘charitable lessons’, which were designed to train the sons of indigent parents as choirboys. His most famous pupil was Gaetano Donizetti. Mayr was one of several composers credited with the invention of the so-called Rossinian crescendo. He is also believed to have been the first to introduce the harp and the cor anglais to the Italian operatic orchestra. Believing that ‘the simplest means are always the best’, he concentrated on purity of melody, and on choosing instruments, especially solo instruments, for their timbre and colour. Consequently, one has to listen ‘inwardly’ to his music: to harmonies, to instrumental colours and textures, to the unfolding of melodies, to the expression of words and emotions. As Louis Spohr remarked, Mayr has, ‘if not so much imagination as Rossini, yet, certainly, more knowledge and aesthetic feeling’. Antonino Siragusa, Daniela Barcellona, Marilyn Hill Smith, Della Jones, Eiddwen Harrhy, Nan Christie, Sandra Dugdale, Russell Smythe, Philip Doghan, Yvonne Kenny, Kevin John, Robin Leggate, Diana Montague, Myrna Moreno, Penelope Walker, Bruce Ford. Philharmonia Orchestra, Orchestra of the Teatro Liricio ’Giuseppe Verdi’ Triest. Conductors - David Parry (tracks 1, 3-10) and Tiziano Severini (2).